The Save Settings can be used to configure the saving process of recognized images. You can individually tune each output format. 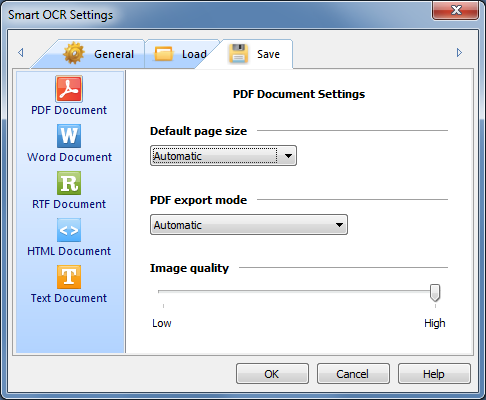 Using these settings you can control the PDF generation process. Automatic - Smart OCR will choose the most appropriate size for you. For PDF files it is suitable to retain the original image size in almost all cases. A3 - The generated PDF pages will be A3 (11.7 inches × 16.5 inches) size. A4 - The generated PDF pages will be A4 (8.3 inches × 11.7 inches) size. A5 - The generated PDF pages will be A5 (5.8 inches × 8.3 inches) size. Letter - The generated PDF pages will be Letter (8.5 inches × 11 inches) size. As image size - The size of the generated PDF pages will be the same as the size of the original images. Automatic - Depending on the document structure Smart OCR will choose the most appropriate mode for you. Text only - The generated PDF document will contain only text. If the recognized page contains additional pictures, these pictures will not be included in the PDF file. 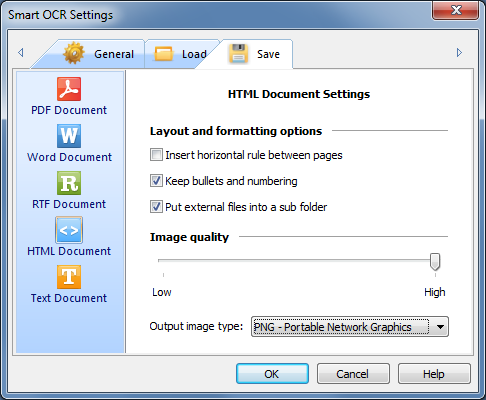 Text and images - The generated PDF document will both recognized text and images. Text under page image - The generated PDF will contain all of the recognized text and additionally will preserve the source image of the page over this text. This way the PDF file will be the exact copy of the source image but it will also contain all of its text, so you can search, select and copy text from it. Text over page image - Same as Text under page image with the only difference that recognized text will be placed over the page image. Image quality - Using this slider you can determine the duality (compression level) for images which will be embedded in PDF documents. These settings will affect the DOC generation process. 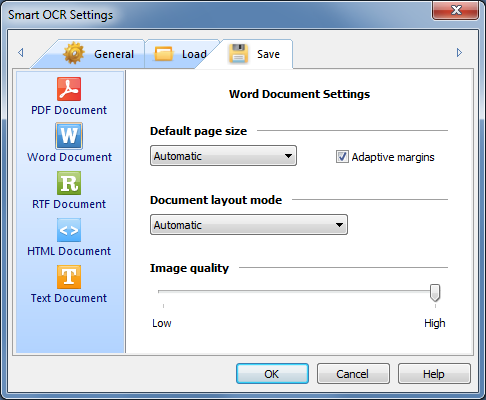 Automatic - Smart OCR will choose the most appropriate size for Word Document pages. A3 - The generated DOC file pages will be A3 (11.7 inches × 16.5 inches) size. A4 - The generated DOC file pages will be A4 (8.3 inches × 11.7 inches) size. A5 - The generated DOC file pages will be A5 (5.8 inches × 8.3 inches) size. Letter - The generated DOC file pages will be Letter (8.5 inches × 11 inches) size. As image size - The size of the generated DOC file pages will be the same as the size of the original images. If Adaptive Page Margins option is checked Smart OCR will change the page margins in order to make all of the text visible and to position the output text much better. If this option is not checked the default margins for each format will be used. This option is recommended and by default is checked. Automatic - Depending on the document structure and complexity Smart OCR will choose the most appropriate layout mode for you. Exact look - Precise layout of the output document using frames to position text and objects. Flowing text - In this mode the final document is easy to edit but the layout may differ from the original image. Formatted text - Choose this mode if you need only text, without pictures. The text formatting will be preserved and you can easily edit the document. Plain text - You can choose this mode if you need only text, without formatting and pictures. It will look just like if you have typed in Notepad. Image quality - Use the slider to specify compression level for images which will be included in Word Documents (.DOC). These settings will affect the RTF document generation process. Automatic - Smart OCR will choose the most appropriate size for RTF pages. A3 - The RTF pages will be A3 (11.7 inches × 16.5 inches) size. A4 - The RTF pages will be A4 (8.3 inches × 11.7 inches) size. A5 - The RTF pages will be A5 (5.8 inches × 8.3 inches) size. Letter - The generated RTF pages will be Letter (8.5 inches × 11 inches) size. As image size - The size of the generated RTF pages will be the same as the size of the original images. Automatic - Depending on the document structure and complexity Smart OCR will choose the most appropriate layout mode. Formatted text - You can choose this mode if you need only text, without pictures. The text formatting will be preserved and you can easily edit the document. Plain text - Choose this mode if you need only plain text, without formatting and pictures. Image quality - Use the slider to specify compression level for images which will be included in RTF documents. With these settings you can tune HTML file generation. Layout and formatting options - Use these options to customize HTML file layout and formatting. Insert horizontal rule line between pages - Check this option if you need a horizontal rule line between recognized document pages in final HTML file. Retain bullets and numbering - Check this option if you want to retain bullets and numbering symbols in the HTML file. Put external files into a sub folder - If this option is checked all external files (for example images) will be generated into a sub folder. Image quality - Use the slider to specify compression level for images which will be included in HTML files. You can select the file format from Output images type combo-box. You can change these settings in order to customize text document generation. Formatting options - Use these options to customize text file formatting. Insert line breaks - If this option is checked a line break will be inserted in text file after each line from the recognized document. Insert paragraph breaks - If this option is checked a paragraph break will be inserted in text file after each paragraph from the recognized document. Insert page breaks - If this option is checked a page break will be inserted in text file after each page from the recognized document. Retain bullets and numbering - Check this option if you want to retain bullets and numbering symbols in the text file. 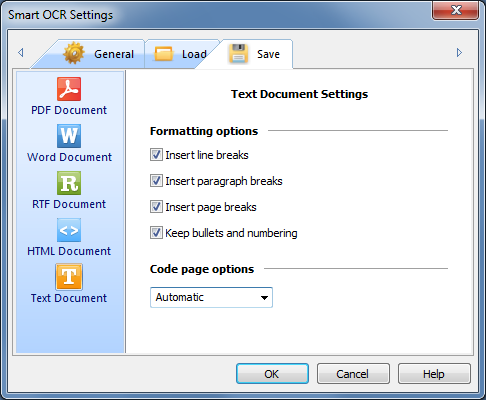 Code page options - You can choose a code page for your text file. By default (in Automatic mode) Unicode is used. You can change the content of code page combo box in order to specify a code page for your text file.